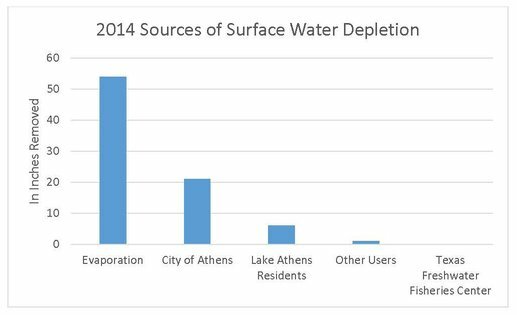 Just WHO Consumes the Most Water from Lake Athens? It probably isn’t who you think! In 2014, the evaporation process removed a staggering 54.21” of surface water from Lake Athens. Following evaporation, usage by the City of Athens dropped Lake Athens another 21”. 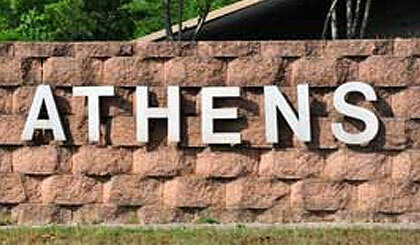 The next largest consumers are the residents surrounding Lake Athens. 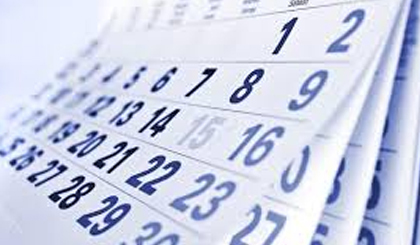 Privately owned pumps removed a conservative 185,481,000 gallons of water in 2014, resulting in another 4.6” drop. Other private users removed less than 1”. 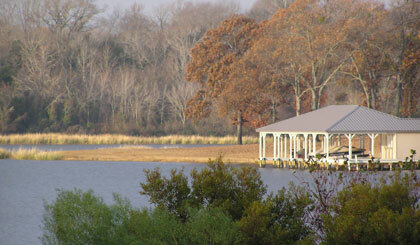 The Texas Freshwater Fisheries Center removed virtually no surface water from Lake Athens. Interestingly, if you divide the number of gallons removed by the number of families served, the Lake Athens Residents win the race for most usage. 301 individually owned water pumps are responsible for using a conservative 185,481,000 gallons of water each year. That’s 616,215.95 gallons per household! As seen in this chart, the Texas Freshwater Fisheries Center used 2,672.4 million gallons of water in 2014. However, they returned 2,821.1 million gallons of filtered water back into Lake Athens. AMWA is proud to partner with Texas Parks & Wildlife and the Texas Freshwater Fisheries Center in their usage of our water resource. There has never been a more eco-conscious group in Athens. In addition to recycling their water, TFFC also runs much of their day-to-day operations using solar panels to conserve electricity. We would all do well to follow their examples. Based on consumption of 850,000,000 gallons in 2014. The Texas Freshwater Fisheries Center is a “Zero Use” facility. The State of Texas requires that their usage be considered in the Safe Yield calculations of AMWA. However, they are not given credit for the water that they filter and return to Lake Athens. Each year, TFFC returns at least 99% of the water they borrow from Lake Athens. Historically, some years they return as much as 110%. Boating Safety is for Everyone!